You can link to other pages in your app from Custom Pages if they are in your menu. The code below has examples that you can put into your custom pages. See links at the top of page for links for your WordPress pages. You can now use page slugs to open certain menu items. If a menu item is a custom page or a list, there is a page slug associated with that page. See find the page slug. For menu items that are external links, no page slug is associated with this, so you still need to use the method described above and refer to the item using an index number. 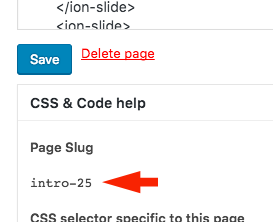 To find the page slug of your custom pages, open the custom page editor and click the "CSS & Code Help" header.